The patella tendon connects the kneecap to the shin bone. A partial rupture of this tendon is often from a jumping or explosive load on the tendon. People who have previously suffered from patella tendon injuries are more at risk as the tendon is weakened. This knee injury causes swelling and is very painful. 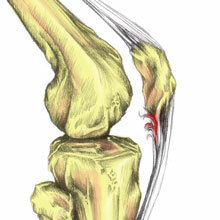 Patella tendon ruptures are extremely painful and may be accompanied by an audible ‘pop’ at the time of injury. There will be swelling of the knee, particularly at the bottom of the knee over the tendon. The athlete will be unable to put weight on the knee or hold the knee in a straightened position. The patella tendon or patella ligament as it is sometimes called connects the patella or kneecap to the front of the tibia or shin bone at a protrusion called the tibial tuberosity. Its function is to act as a lever arm for the quadriceps muscles. The quadriceps themselves insert into the upper surface of the patella and when the contracted pull on the patella, and thus the patella tendon, to straighten the knee joint. The patella tendon is prone to rupturing in individuals with a history of patella tendon injuries such as jumpers knee or degeneration due to age. Injuries of this type serve to weaken the patella tendon and in the event of strong eccentric quadriceps contraction which is where the muscle contracts while it lengthens such as landing from a jump, the patella tendon may snap or rupture most commonly at the lower end of the patella. Corticosteroid injections given to address the inflammation seen in jumpers knee type injuries are also known to increase the risk of a patella tendon rupture. Apply PRICE technique as soon as possible. Rest and protect the knee from further injury. Apply ice or cold therapy as soon as possible after the injury. Ice should not be applied directly to the skin but use a wet tea towel or similar. Cold can be applied for 10 minutes every hour for the first 24 to 48 hours depending on how bad the injury is. A doctor may prescribe NSAID’s or anti-inflammatory medication, for example, Ibuprofen for pain relief and to help decrease swelling. Seek professional medical assistance, especially if the injury is very painful or prevents walking. If the patella tendon becomes completely ruptured across its width and thus surgical intervention is required to repair the damage. This involves suturing (stitching) the torn tendon. Following surgery, the patient will be advised on a specific rehabilitation plan which normally involves little or no weight-bearing on the affected knee and wearing a knee brace to prevent the knee from bending. This may be required for more than 6 weeks. Once the knee brace has been removed exercises to regain full range of movement and build up the strength of the quadriceps muscle group should be carried out. Rehabilitation after a patella tendon rupture is extremely slow and it may take between 6 and 12 months before the patient is able to return to sports.